"Scalpel. Forceps. Drill." Crunch. "Leucotome." Screams. And so begins the first of three stories from the Theatre Of The Damned who have brought their play Grand Guignol to London for its first full-length run. This is not a show for the squeamish - one woman fainted during the first play when we saw it and if you were looking for post-Halloween chills of the non-temperature-related variety, we suggest you walk right past the overhyped Ghost Stories and keep going until you get to the Etcetera Theatre. The usher (actor/company manager Sam Winthrop) greets you in his blood-stained apron setting the tone for this collection of three plays. In the first, Crime In A Madhouse, Kate Quinn as asylum inmate Louise tries to persuade her doctor (Tom Richards) and a nun (Jeanette Rourke) of her sanity in an effort to escape her nightly horrors. Is she paranoid or are her co-patients really out to get her? The second feature, The Last Torture is a grisly and gritty piece of tightrope-taut tension as a British mission are trapped in China during the Boxer Rebellion and on the verge of a nasty end at the hands of the revolutionaries. Seamus Newham is immense as the commander forced to make an excruciating choice. Last (and best) is The Art Of Death, a re-imagining of the early days of Grand Guignol with its real-life founder Andre de Lord (Richards again) finding a new way to horrify his audiences (in a good way) by making a pact with the devilish Gilles (Simon Evans). The acting throughout is excellent, especially from the more experienced members of the 18-member cast some of whom take on more than one role. Tom Richards' switch from dead-eyed doc to desperate director was especially enjoyable. The theatre is tiny which adds to the effect; like it or not, your attention is focussed on the developing horror which is both gnawing and gory; fainting woman aside, the show was punctuated by genuine screams and squeals. If you have the stomach for this, miss it at your peril. Tickets are £10 each and can be bought online or at the box office in person. You want more photos of this show? Step this way. 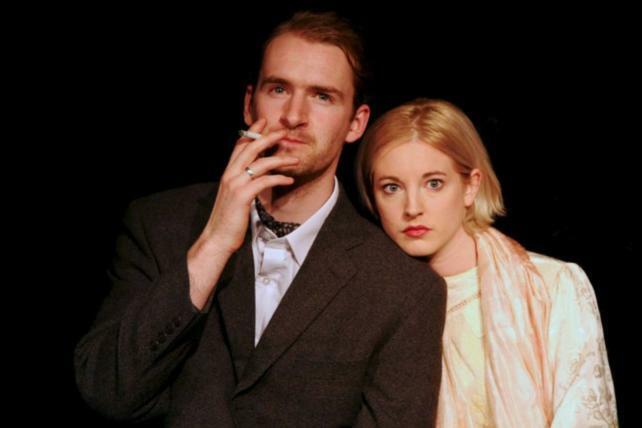 More reviews of shows at the Etcetera Theatre. Your tip-top guide to the arts this week.